Penn Staters for Responsible Stewardship (PS4RS) is an organization of alumni, students, community members, university members, parents of students and supporters of the University. We aim to achieve positive change at Penn State and restore the University’s reputation. PS4RS is an organization, governed by a seven-person volunteer board, that is managed by proud Penn Staters who are volunteering their time for this effort. The organization does not have any paid employees. The PS4RS board meets monthly to discuss strategy, action items and issues related to the leadership of Penn State. We strongly encourage new ideas that support our mission, and kindly ask that you email ps4rsinfo@ps4rs.org with a specific proposal if you wish to have yours considered by our board. The organization does not have any paid employees. 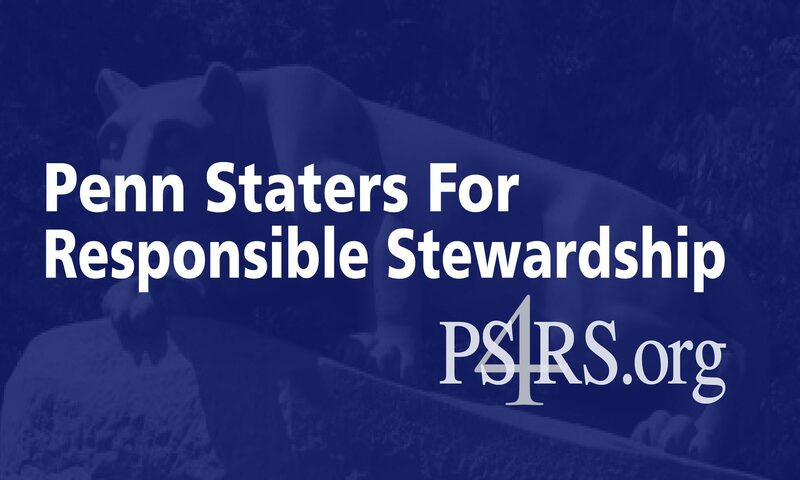 Penn Staters for Responsible Stewardship is registered as a not-for-profit corporation in the State of Pennsylvania, but at this time does not have tax-exempt status. The organization currently has more than 20,000 members which represent a diverse cross section of the Penn State community from the United States and several foreign countries. PS4RS Board of Directors meets monthly to discuss strategy and tactics related to the primary mission of the organization: to remove or replace all of the Penn State University Trustees who were at the helm as of November 2011, in the quest for more transparent and trustworthy leadership.